On arrival in Chennai Airport / Railway Station, our representative will meet and transfer to Chennai Hotel, Visit Local Sight seeing in Chennai like Temples and Merina beach. Overnight at Hotel in Chennai. After breakfast proceed to Tirupathy. Visit Balaji Temple. After dharshan check in the hotel. Overnight at Hotel in Tirupathy. 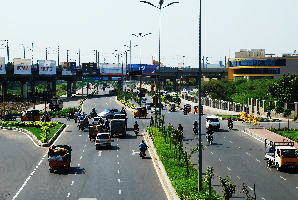 After breakfast drive to Vellore, visit Golden Temple and sight seeing in Vellore. Then drive to Thiruvannamalai. Visit thiruvannamalai Temple. Overnight at Hotel in Thiruvannamalai. After breakfast, then proceed to Pondicherry. Visit Pondicherry Beach. Then drive to Chidambaram, Visit Natraj Temple. Then check in the Chidambaram hotel. Night stay in Chidambaram. 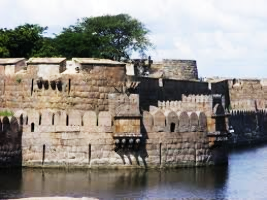 After breakfast drive to Tanjavur, Visit Tanjavur Big Temple then drive to Trichy, short name of Trichirapalli, situated on the banks of Kaveri River is a blend of history and tradition as well as pilgrim centre, it is famous for Ranganath temple at Srirangam. Arrive Trichy and check-in at hotel. Later visit Rock fort and its temple at a height of over 23mts. Also visit Srirangam and Jambukeshwar Temple. Night stay in Trichy. 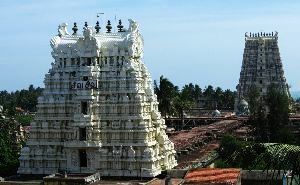 After breakfast drive to Rameswaram tour, the most sacred temple town of India is an island hallowed by the epic Ramayana, where Lord Rama is said to have visited before going into battle of Srilanka. Legend has it that Lord Rama sent Hanuman to Mount Kailash to bring a Lingam for worship when he set foot after defeating Ravana. As Hanuman did not return when the auspicious hour was approaching, Sita made a sand Lingam so that worship could be performed in time, which is where the present day Ramanatha Swamy Temple stands close to sea on the eastern side of the island. One of the twelve Jyotirlingam shrines is also well known for its magnificent corridors and the massive sculptured pillars lining them. After taking breakfast. 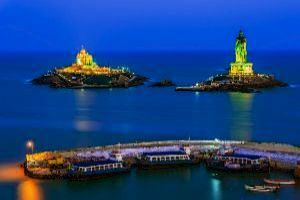 Drive to kanyakumari, visit kanykumari sightseeings , visit vivkandha rock and gandhi mandabam, kanyakumari temple etc. Overnight Stay at Hotel Kanyakumari. Breakfast at hotel and drive to Kodaikanal. Kodai is situated at an altitude of about 2,133-m high and covers an area of 21.45-sq-km. The hill town is renowned for its educational institutions of international repute. The hill-plantain fruits and plums are known for their freshness and taste. 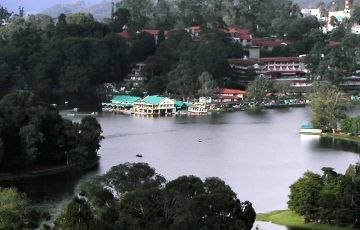 Berijam lake, one among the beautiful lakes of South India, spreads over an area of 24 hectares. Evening visit lake. Overnight at Kodaikanal. After breakfast drive to Madurai, it’s ancient city of Madurai, some 2600 years old is laid out in the banks of river Vaigai as a lotus flower with the Meenakshi temple in the centre. visiting – Meenakshi temple, King Tirumala’s Palace, Mariamman Tepakkulam and Alagar Kovil. And transferred to Madurai Airport/railway station to connect your onward flight with happy memories. We assure you our very best service, assistance and hospitality at all times.